Click the "Day" tab on the main window. Click the "Day" command in the Go menu. The Day View shows entire day(s), divided into timeslots. It can show up to 14 consecutive days side-by-side, independent of the week in which they belong. The currently displayed date(s) will be shown at the top of the Day View, with left and right arrow buttons for navigating to the previous or next day. The displayed date(s) can also be selected from the Navigation Pane. A "Today" button showing today's date is provided in the upper-right corner. Clicking the Today button will result in today's date appearing in the Day View. Multiple days can be displayed at the same time. This setting can be accessed by clicking the "Settings" button in the upper-right corner. The zoom in/out buttons can be used to adjust how many timeslots are displayed on the screen. Zoom out to reduce scrolling, zoom in to see more detail. 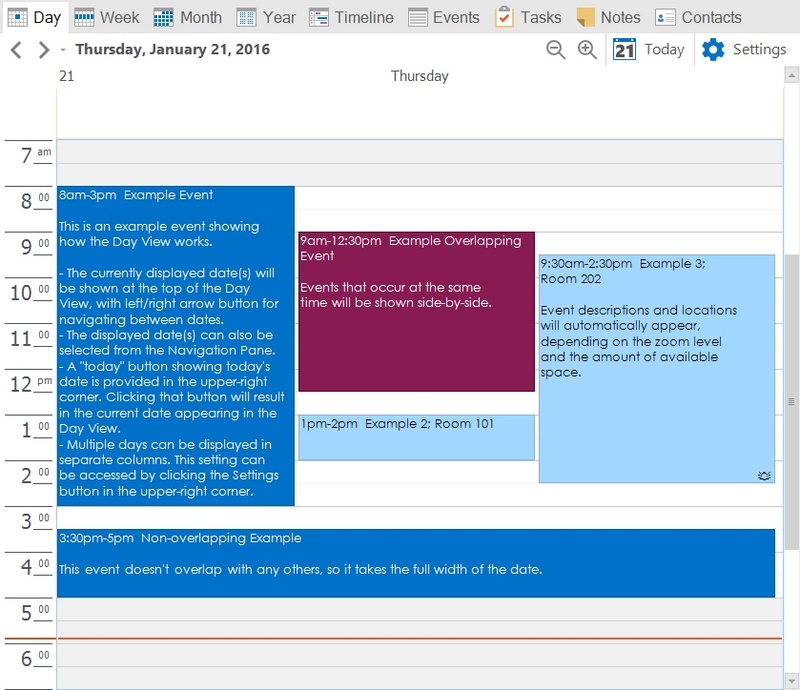 Events that last all day or span multiple days are displayed in the day header area. Notes will also be displayed in the header area. A secondary time-zone can be displayed along the left edge of the Day View via a Calendar Option..
Clicking the "gear" button in the upper-right corner of the Day View will result in a menu appearing where the Day View settings can be modified. To adjust the number of simultaneously displayed days, select a day count from the menu. Up to 14 days can be displayed side-by-side. When multiple days are displayed, the left and right navigation arrows will cause the Day View to move by the selected number of displayed days. The displayed timeslot length can be adjusted between 1 and 60 minutes. The default timeslot length is 30 minutes. The zoom in/out buttons (to the left of the settings button) can also be used to adjust the timeslot length. In addition, if your mouse has a scrollwheel, you can hold the Ctrl key while scrolling the mouse wheel up or down to zoom in or out. 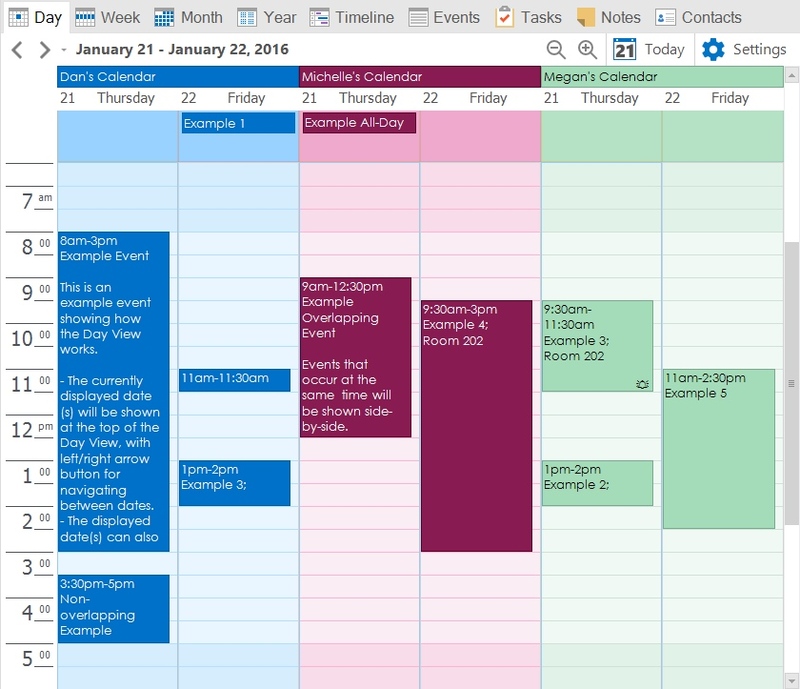 When viewing in overlay mode, all calendars will be merged into a single view, as shown in the example screenshot above. In other words, each date will be shown only once, and if multiple events belonging to multiple calendars exist within those dates, the events will be overlaid in the day. Tasks and notes are also overlaid. When the "View Separate Date/Calendar Columns" option is selected, each date column in the Day view will contain separate sub-columns for each visible calendar. The calendars that are visible can be adjusted using the checkboxes in the Calendar List. 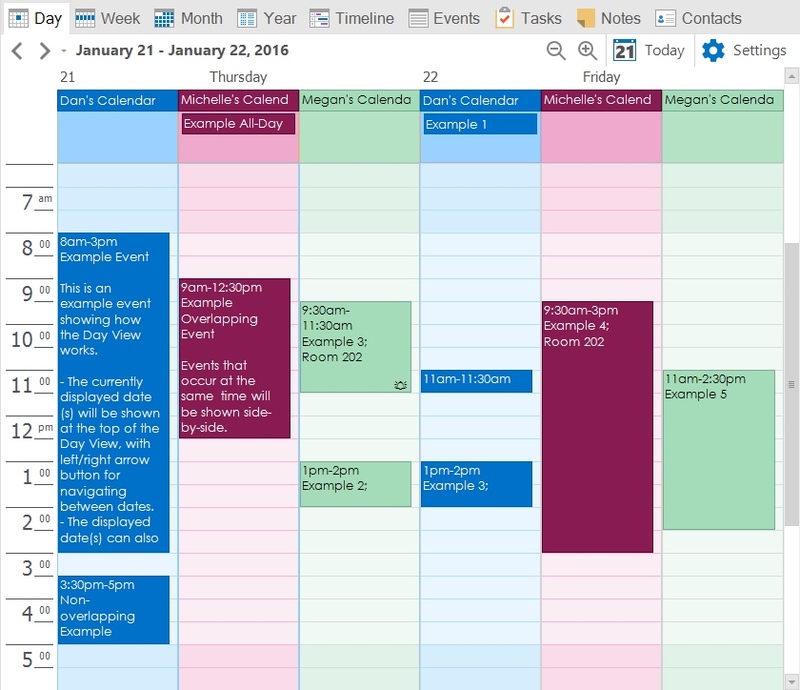 When the "View Separate Calendar/Date Columns" options is selected, each visible calendar will be a column, with one or more visible days being shown as sub-columns of each calendar column. Additional buttons are shown to the left of the settings button. Clicking the Today button will move the Day View to the current date. The button's icon will always show the current date. Clicking this button will increase the time slot length. This is equivalent to selecting the time slot length from the Day View Settings menu or holding the Ctrl key while scrolling the mouse wheel down. Clicking this button will decrease the time slot length. This is equivalent to selecting the time slot length from the Day View Settings menu or holding the Ctrl key while scrolling the mouse wheel up.